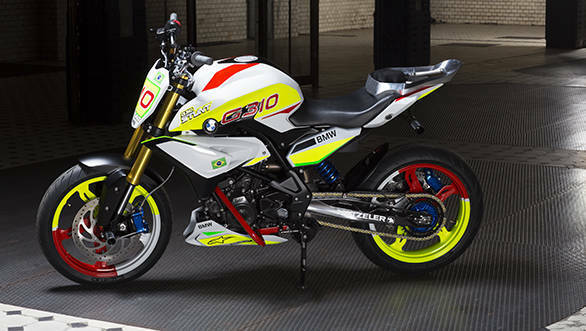 BMW Motorrad has unveiled the Concept Stunt G 310, at a bike show in Brazil. It has been specifically designed for stunt riding with inputs from stunt riding champion, Chris Pfeiffer. This concept gives a preview of BMW's upcoming India-bound sub-500cc motorcycle codenamed K03, which was developed through the BMW-TVS collaboration. 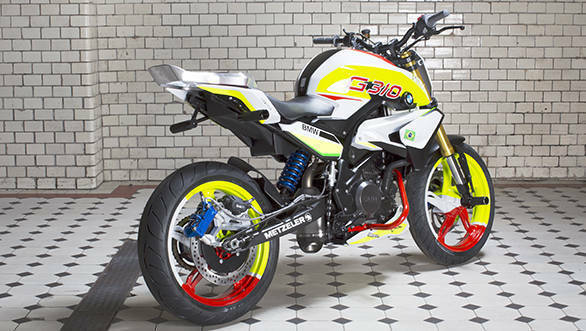 The Concept Stunt G 310 uses a newly developed single-cylinder DOHC engine which is unconventionally inclined towards the rear of the motorcycle. This, according to BMW Motorrad, allows for better placement of the engine to give the bike a short wheelbase despite a long swing arm. BMW says that the Concept Stunt G 310 in this setup, along with a low-slung front end and a raised tail section, offers "fast and nimble changes of direction as well as dynamic riding." The motorcycle's gear ratios too have been designed specifically to provide enough propulsion at low engine speeds. The Concept Stunt G 310's intake area is biased towards the front of the engine, while the exhaust system is placed more towards the rear of the motor. This allows for a vertically positioned rear silencer under the seat, between the engine and the spring strut. This setup is supposed to ensure that the exhaust system is not damaged while performing stunts on the motorcycle. BMW has fitted a second brake lever just above the clutch lever to operate the rear brake in case the rider's foot is not on the footrest while performing a stunt. 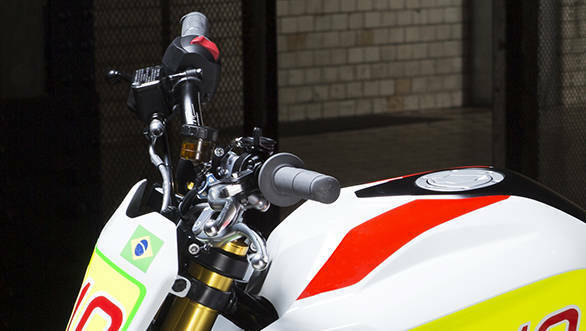 The Concept Stunt G 310 also gets an aluminium "stunt" tail that was specifically developed by BMW Motorrad. This component has an opening in the centre to provide a niche for the rider's foot. Additionally, stunt pegs have been fitted onto the front axle and near the seat, along with red crash bars to protect the engine. BMW says that the Concept Stunt G 310 has been designed to present a lower visual centre of gravity that appears to shift to the front. According to BMW the colours are a combination BMW motorsport's white, blue and red, and the Brazilian flag's green, yellow and blue. Based on what we understand from the pictures of the Concept Stunt G 310, the production-spec version is likely to get a trellis frame. Other features that could be carried forward include a monoshock set-up with inverted forks up front and disc brakes on both wheels. 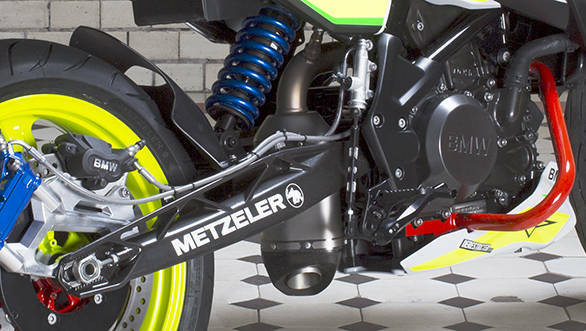 The concept uses Metzeler Sportec M7 RR tyres, and while these might not make it to production, the 17-inch wheels should. The production-spec bike will carry forward the same engine and exhaust set-up, however, the end can could have a more conventional design and placement. The top of the long swing arm has detailing similar to the Duke, but is a bit more subtle. The front seat on the concept is quite flat like the KTM Duke 390, but much wider. The final product could be a direct rival to the KTM Dukes 200 and 390, and the Kawasaki Z250. 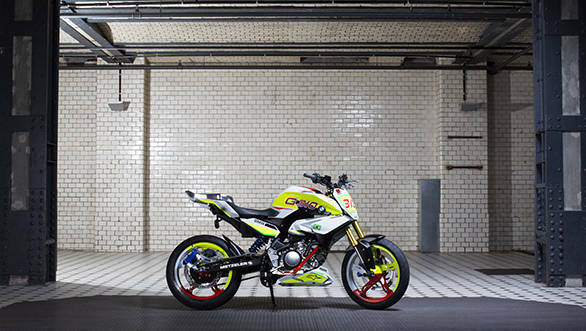 Press Release - BMW Concept Stunt G 310  Street. Style. Stunt. Munich/São Paulo: With the world premiere of the BMW Concept Stunt G 310 at South America's largest motorcycle show, BMW Motorrad is presenting a completely new side: the uncompromising interpretation of an aggressive and agile stunt bike based on a single cylinder study. Thanks to his experience as a four-times World and European stunt riding champion, Chris Pfeiffer, contributed to the realisation of the BMW Concept Stunt 310. "Stunt riding is a demanding and multi-faceted sport. Ideally you need a compact, agile bike which is also stable and robust at the same time. You have to achieve the ideal balance between aggressiveness and control", explains Chris Pfeiffer. Compact proportions, highest-level agility. The BMW Concept Stunt G 310 combines all these qualities and makes clear at first sight: the newly developed 1-cylinder engine allows for very compact proportions thanks to its innovative concept. The special feature is the cylinder which is inclined towards the rear and the cylinder head which is rotated by 180 degrees. This permits optimum placement of the engine in the motorcycle and a short wheelbase in spite of the long swinging arm thereby making the motorcycle very agile. The low-slung front and the raised tail section promise fast and nimble changes of direction as well as dynamic riding. By shifting the intake area towards the front while also moving the exhaust system towards the rear it was possible to place the rear silencer in an upright standing position underneath the seat between engine and spring strut. In this way the silencer is optimally protected and does not limit the stunt rider's freedom of movement. Even though you may hardly see it, you will not overhear it. Once started, the sound of the BMW Concept Stunt G 310 is sure to attract attention. Emotional surface design in typical BMW Motorrad style. The emotional side view of the Concept Bike is characterised by the powerful three-dimensional design of its surfaces. The precise lines and the expressive interplay of the contours create a sense of movement and speed even when the bike is stationary. What is especially striking in this respect are the side wing contours of the fuel tank which significantly emphasise this effect. All lines seem to generate a sense of movement towards the front wheel and underline the playful ease of handling of the BMW Concept Stunt G 310. Simultaneously the bike's surfaces create a compact and distinctive silhouette emphasising the favourable centering of masses around the engine block. The slim front view of the BMW Concept Stunt G 310 also draws attention to its high level of agility. The expressively modelled surfaces of the fuel tank result in a broad shoulder section which is underscored further by the design of the front facia. Similar to its front, the raised, filigree tail promises playful cornering and handling. It shifts the visual centre of gravity to the front even further and in combination with the engine spoiler emphasises the front wheel even more. Extensive stunt modifications. The numerous modifications are typical for a stunt bike; in making them Chris Pfeiffer brought his many years of experience as a stunt professional to bear in cooperation with the BMW Motorrad Design Team. Their single aim is to provide the best possible handling properties for the stunt rider's feats on the asphalt. The lockable throttle ensures constant propulsion even when the rider's hand has to let go of the throttle grip. In addition a slightly altered gear ratio secures greater propulsive force to the rear wheels at low engine speeds while the intentionally oversized rear wheel brake ensures reliable deceleration in every situation. A second, even larger rear wheel brake allows the rider to brake the rear wheel using only his middle finger, in case his right foot is not on the footrest in certain stunts. The additional brake lever is specially placed on the left side of the handlebars and can even be operated at the same time as the clutch. So-called axle pegs on the front axle and in the seat area give the rider additional options for placing his feet which go way beyond the possibilities offered by normal foot rests. The distinctive red crash bars provide additional protection for the engine. A special highlight on the BMW Concept Stunt G 310 is the "stunt tail" which was specifically developed by BMW Motorrad and which has not been seen in this shape on a stunt bike. It is milled from solid aluminium and features an opening in the centre, which offers the stunt rider a hold for his foot. Together with the non-slip seat, the aluminium component also ensures a stable seating position when riding thanks to its shape. Modern colour and material design. The colour concept features the classic BMW motorsport colour white as the base colour as well as red and blue in combination with the national colours of the Brazilian flag in a modern interpretation. The spectacular neon green and yellow colour and material design is certain to attract attention. The bright neon colours extend along the entire body thereby emphasising the dynamic lines and surfaces of the bike. The core of the bike, the drivetrain, features darker colours and moves the visual centre of gravity even lower. Edgar Heinrich, Head of BMW Motorrad Design sums up: "The BMW Concept Stunt G 310 is a real eye-catcher. Everything on this concept seems to be shouting out to ride it and defy the laws of gravity."